Screens and flap gates have historically been installed on overflow pipes, but those have become inferior technology for protecting tanks from birds, animals, airborne pathogens, and most recently risk of terrorist attack. Screens can rust, become dislodged, collect materials like leaves in the overflow pipe, encourage icing on the screen when the surfaces are wet (screen gets blown out on next overflow), do not prevent insects from entering the tank, and do not prevent cold drafts from entering the tank thru the overflow pipe which can promote icing. Flap gates can hang open and can corrode or rust in the open or closed position. 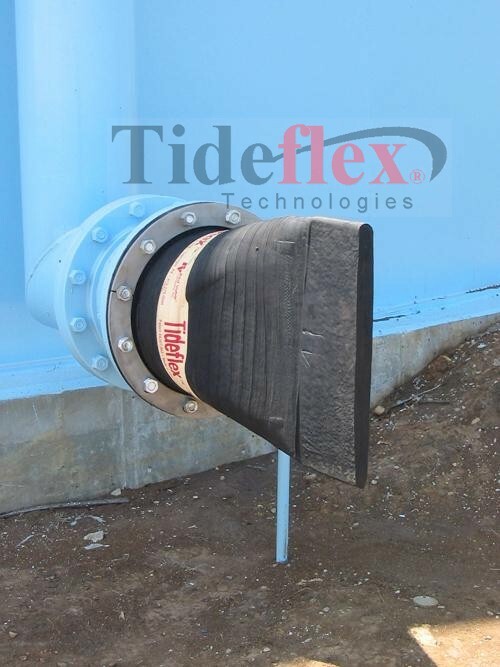 Consider, the Tideflex Valve was invented based on a USEPA grant whose purpose was to overcome operational and maintenance problems associated with flap gates. After 9/11, water utilities had to conduct vulnerability assessments and one area identified for potential terrorist attack was water storage tanks. An overflow pipe with a 2-foot air gap between ground level and the end of the overflow pipe, for example, was considered by many to be an easy access to the potable water in the tank. 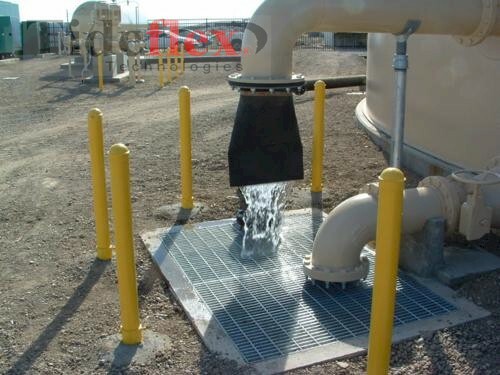 Screens, flap gates, and even Tideflex Valves installed on the end of the overflow could not stop the injection of a liquid or gas into the water volume. 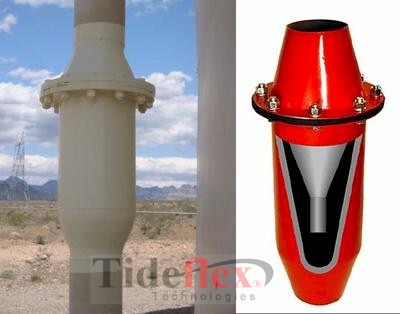 Red Valve developed the Overflow Security Valve (OSV), to address this concern. The OSV is an assembly that incorporates a Tideflex Series 37. The OSV is either welded or flanged into the overflow pipe with tamper-proof bolts. The OSV is installed above the end of the overflow. The deterrent is 1) the Tideflex Series 37 cannot be seen and 2) it would be extremely difficult to access, manipulate or damage the Series 37. The OSV is customized for every tank based on the tank height, overflow pipe size and material, and peak overflow rate. Consult Red Valve Engineering.